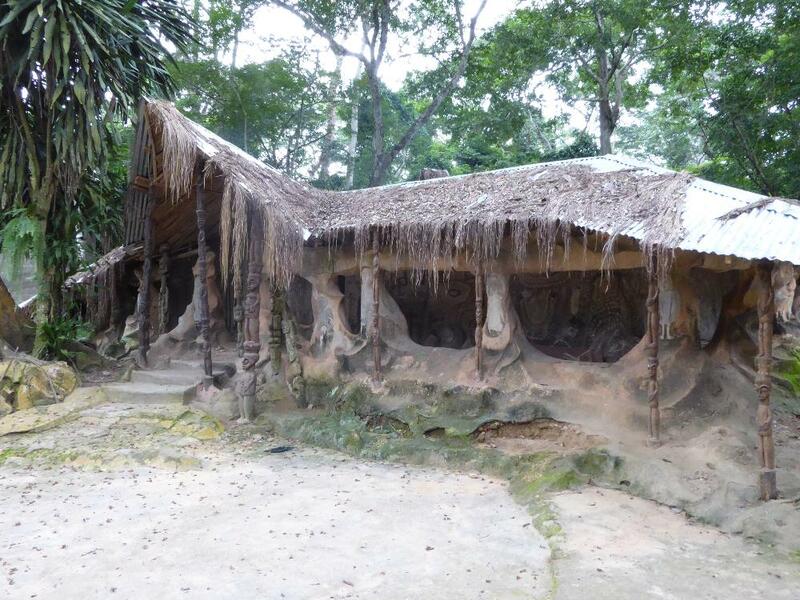 Nigeria has one--count 'em, one--place on UNESCO's list of World Heritage Sites. 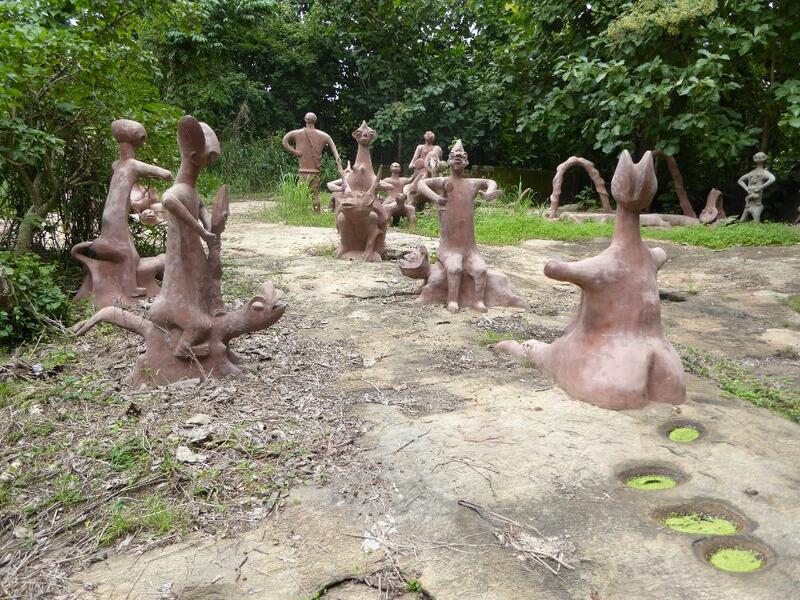 The place is Oshogbo, and the reason is the town's sacred grove, "probably the last," UNESCO writes, "in Yoruba culture." 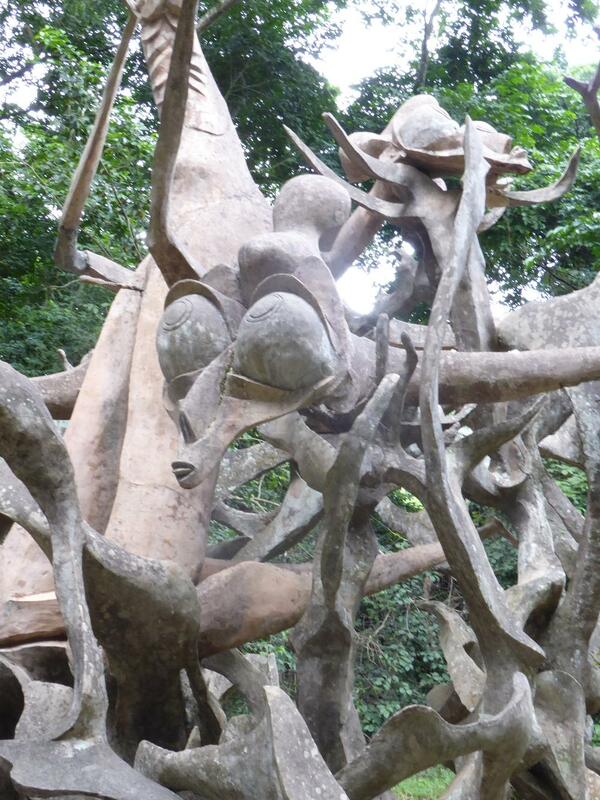 There's a big wrinkle, however, because Yoruba shrines were historically non-figurative, while the sacred forest at Ashogbo is a figurative riot. The reason is simple: the historic shrines were disintegrating for lack of care when an Austrian artist, Suzanne Wenger, arrived in the 1950s. Working with a small group of Yoruba craftsmen, Wenger spent 50 years at Oshogbo and became a Yoruba priestess herself--more Yoruba than the Yoruba, some have said. Was she reinvigorating Yoruba religion or was she introducing forms so new that they cannot be fitted into any reasonable definition of Yoruba tradition? Short answer: mostly the first but arguably also the second. Houses can be substantial. Odd that the biggest house in the village is right on the highway. The builder must have subscribed to the theory of "flaunt it if you have it." So how old is the house? Looks like it's been weathering for a century, but I'm betting it's less than 50 years old. The step outside on the upstairs door is a doozy. 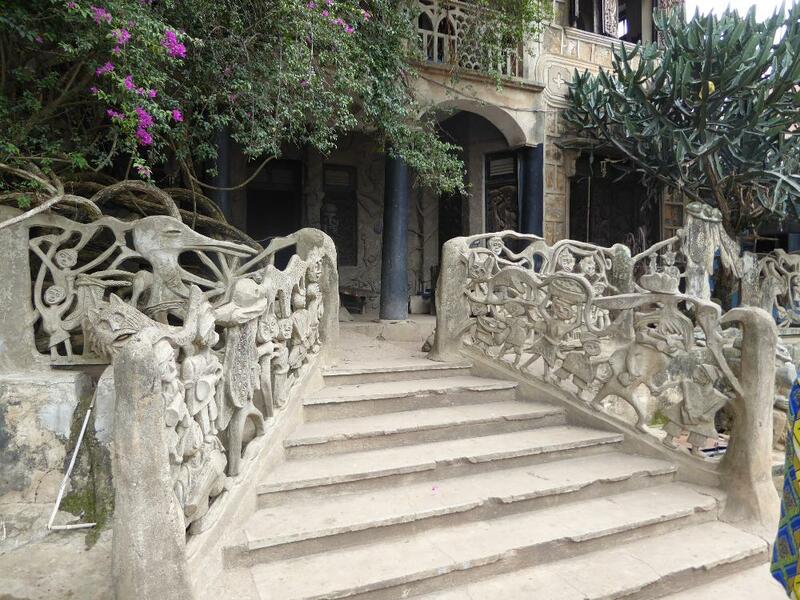 Here's a house in Oshogbo proper: columns, balustrades, decoration. Traditional? Sure, but whose? One man's tradition is another's vulgar novelty. Case in point: on the road from Lagos up to Ibadan, this is the huge revival ground of a pentecostal faith established in 1952 and now with millions of adherents. Come at the right time, and it's a city. Here in Oshogbo, too, Christianity will be an anchor of stability for some and a recent import for others. 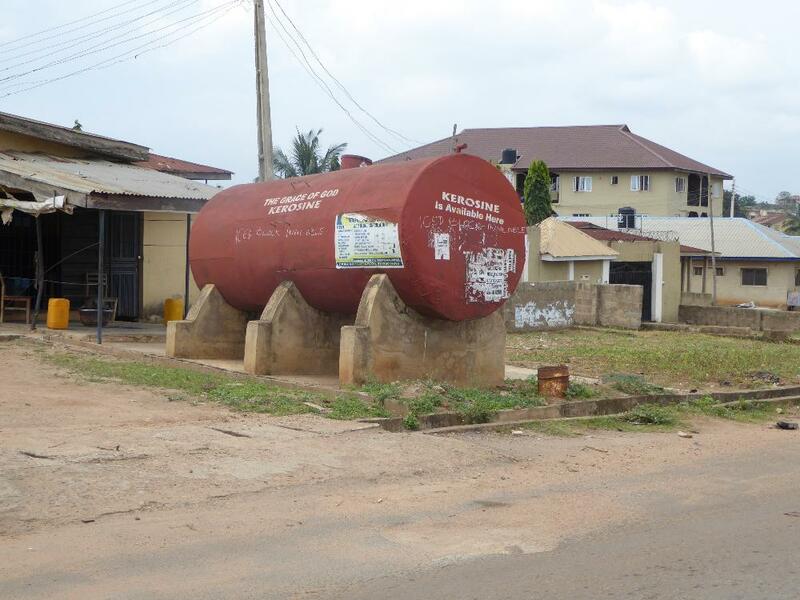 Either way, it arrived in 1900 with the first Oshogbo station of the Church Missionary Society. By 1908 the station had baptized 220 adults, and the Oshogbo Training Class for Evangelists had enrolled eight students. Islam was already here and could take care of itself in the upcoming contest, largely because Islam didn't object to polygamy. 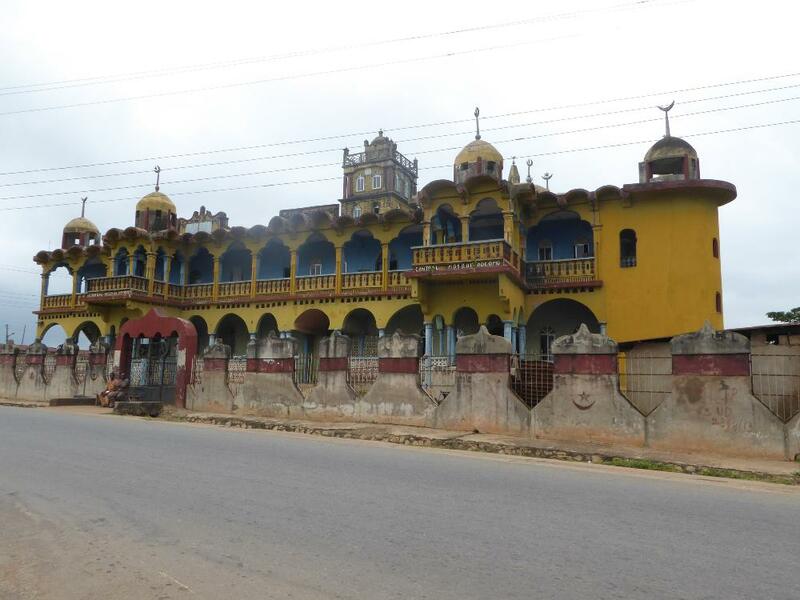 This mosque is at Odeomu, 20 miles shy of Oshogbo. 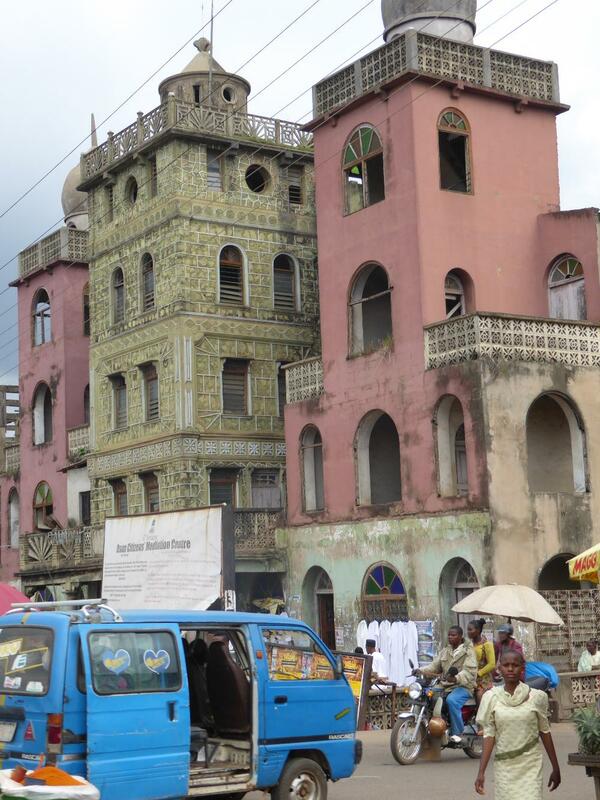 And here's the central mosque of Oshogbo. There's some irony is Islam's presence here, but you have to dig a bit. 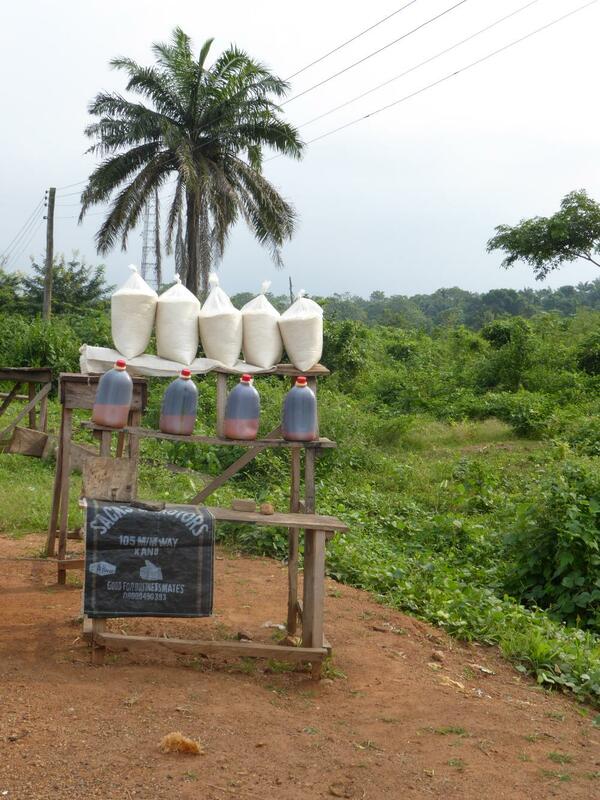 The town had been established about 1700 by settlers from Ibokun, some 15 miles to the east. Their descendants had been overwhelmed or at least outnumbered after the Muslim army of the Fulani in 1834 destroyed Oyo Ile, about 50 miles to the northwest. 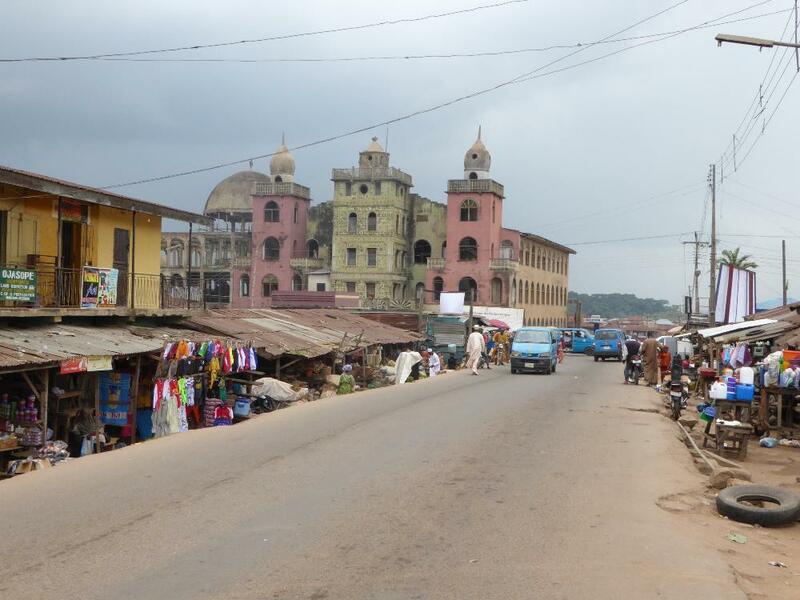 Many of that town's residents fled to Oshogbo, and here's the irony: many of them had converted from traditional Yoruba religion to Islam by the time that the Christian missionaries arrived. The ataojos or kings of Oshogbo themselves became Muslims. 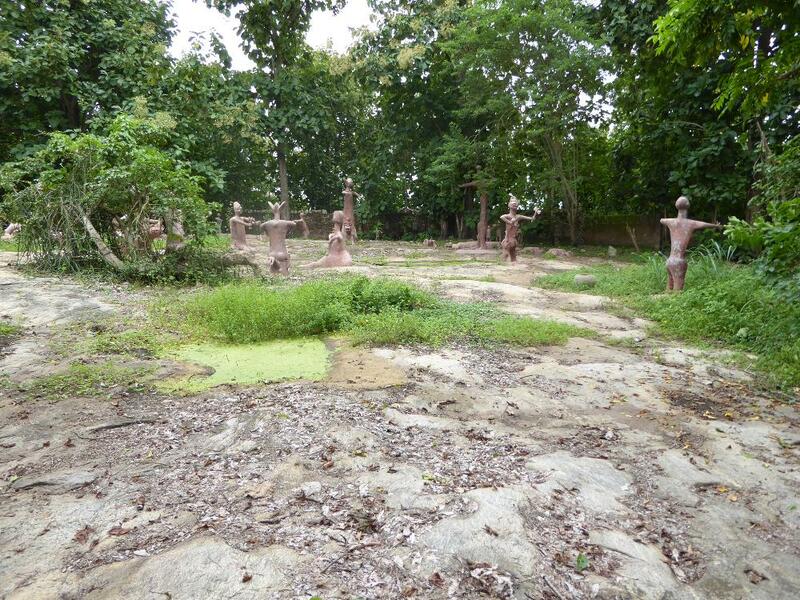 The Christian missionaries were hard workers, however, and the ataojo who was crowned in 1933 was a Christian. European civilization came, too, first with establishment of British rule in the 1890s and in 1905 with a narrow-gauge railroad from Lagos. The missionaries liked the convenience of the railroad but complained that the trains were "followed by the advent of representatives of the principal Lagos trading firms, whose influence has not been altogether on the side of righteousness." Any doubts about what they mean? They're thinking about rum and gin but don't want to even speak those words. See Proceedings of the Church Missionary Society, 1907-1908, p. 30. By 1905 Oshogbo had 60,000 people and, along with the railroad, its first European school, All Saints. The British Cotton Growing Association opened a gin two years later. 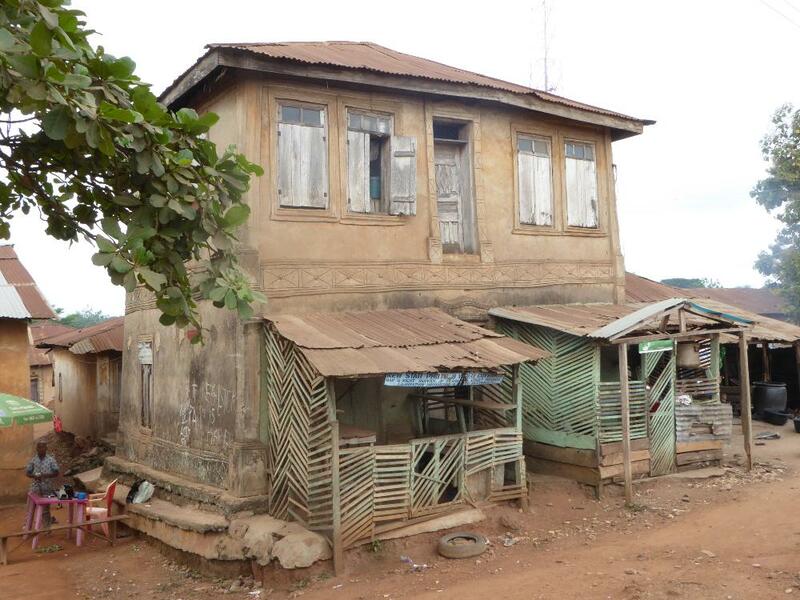 The Bank of British West Africa finally opened a branch in 1924, and by 1955 Oshogbo had electricity, a radio station, and 150,000 residents. Three years later, Suzanne Wenger arrived with her husband, Ulli Beier. They had come to Nigeria five years earlier so that he could take up an appointment at the University of Ibadan. Neither of them liked the school's Eurocentric curriculum or its racial separation, and in 1958 they moved to Oshogbo. Neither of them had much use, if any, for Islam or Christianity, but they fell hard for Yoruba religion. By then, however, that religion was on the skids. One indication: the margins of the sacred grove in the center of town were being nibbled at by farmers. Ulli Beier would later write of Islam and Christianity that "the so-called 'universal' religions were found more compatible with the basically materialist ways of life that had been adopted from the West." See Ulli Beier, The Return of the Gods, p. 12. 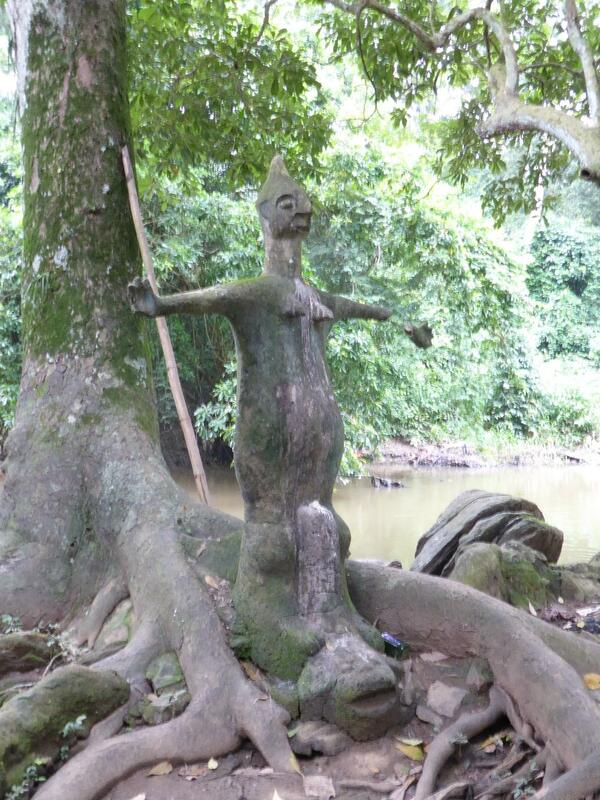 The grove was sacred because it sheaths the Osun River, which was sacred because the river is understood to symbolize Osun, one of the most important Yoruba deities or orishas. 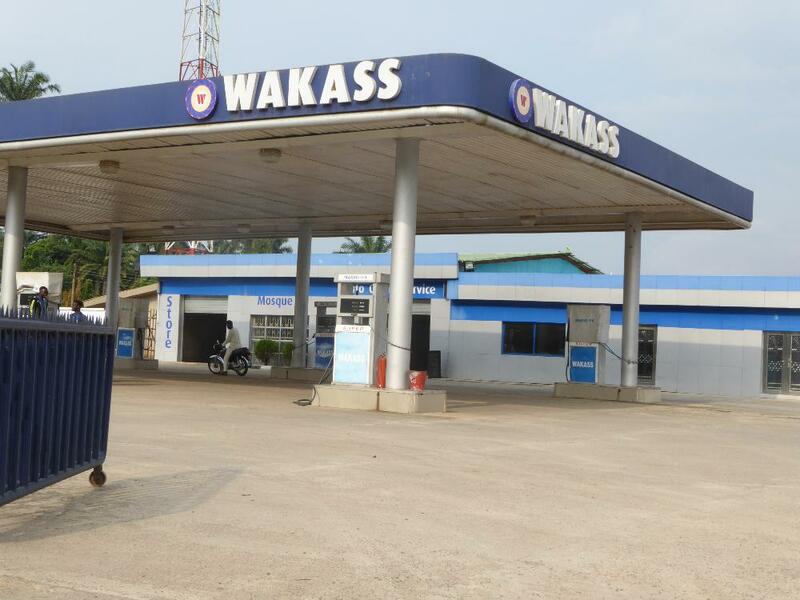 Why there should be this association is unclear, but the devotion to Osun has an explanation once accepted by many. 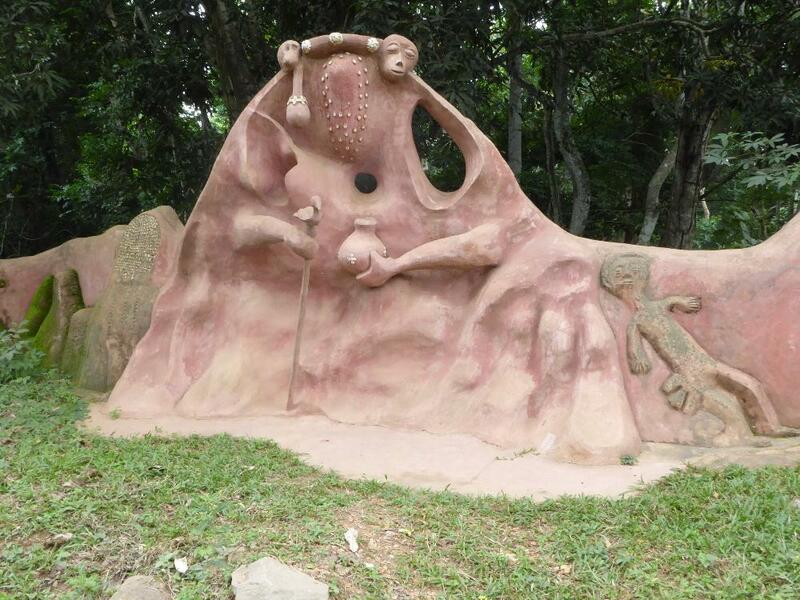 Timoyin, the legendary founder of Oshogbo, had made an agreement with the goddess. She would protect his people, and they in turn would hold an annual festival in her honor. She, it was said, had kept up her side of the bargain when she had repelled the Fulani army that destroyed Oyo Ile. The festival would be and is even now held alongside the river. 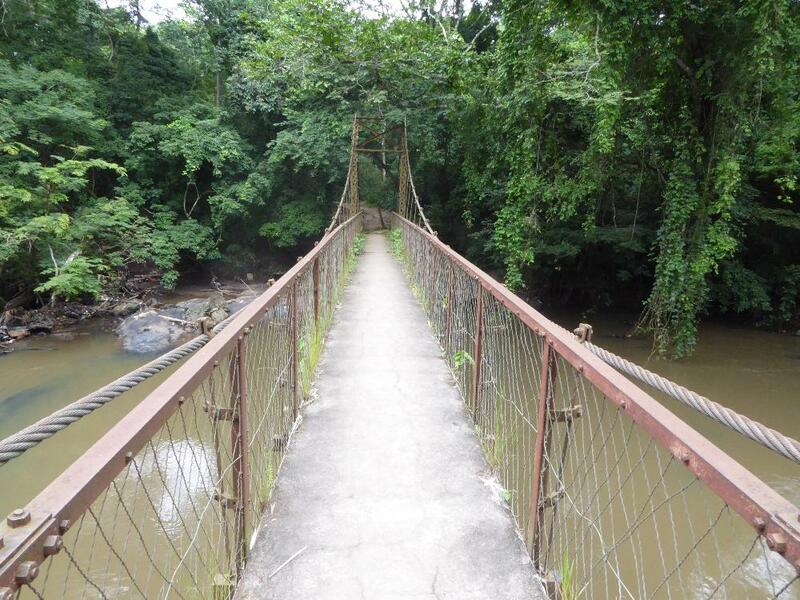 In 1935 the local British administration built this bridge across the river. Would it have been tolerated if Yoruba religion had still been strong? Maybe not. A road through the forest followed. 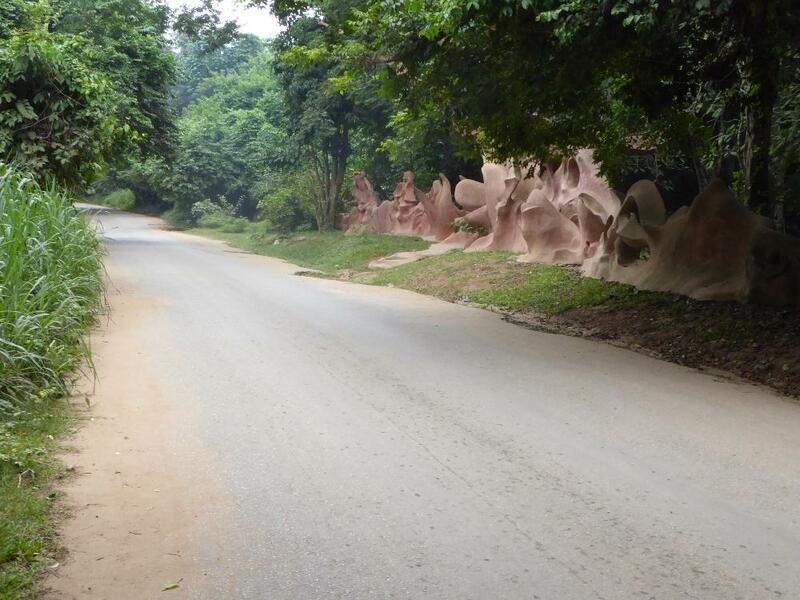 Try that road and you'll see that something else was arriving in Oshogbo besides suspension-bridge progress. Welcome Suzanne Wenger. Whoa! It's the Chameleon Gate, with one serious tail. There is no detailed guide to these figures, either on paper or in little plaques stuck in the ground, so a visitor is pretty much on his own despite local guides whose services are almost mandatory. Still, even someone completely ignorant of the Yoruba pantheon can see this fence as the work of an artist infatuated with untrammeled nature. Straight lines, begone! Clocks and rulers, avaunt! Here the wall takes the form of a Yoruba masquerade, one of the masked and costumed figures used in Yoruba ceremonies. This is the Arch of the Flying Tortoise. 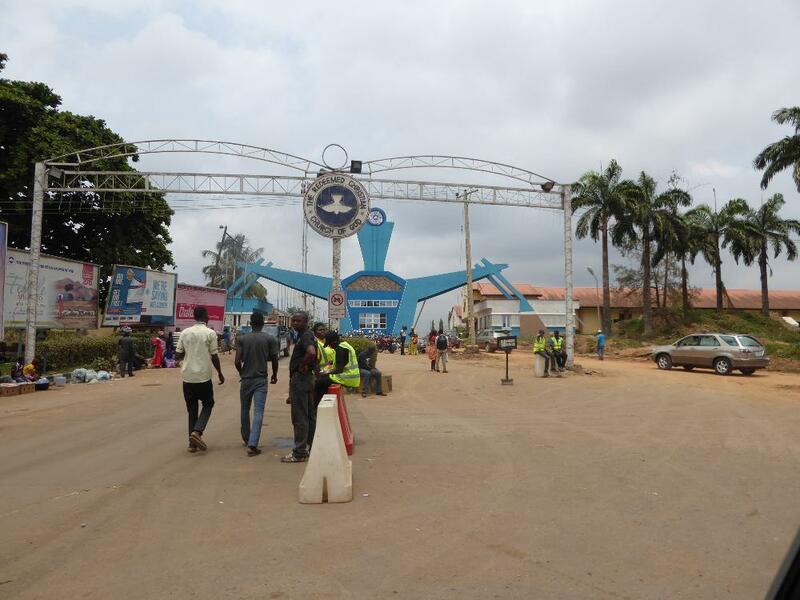 It's the main gate into the Ojubo Oshogbo, which is to say the Oshogbo site for prayers. 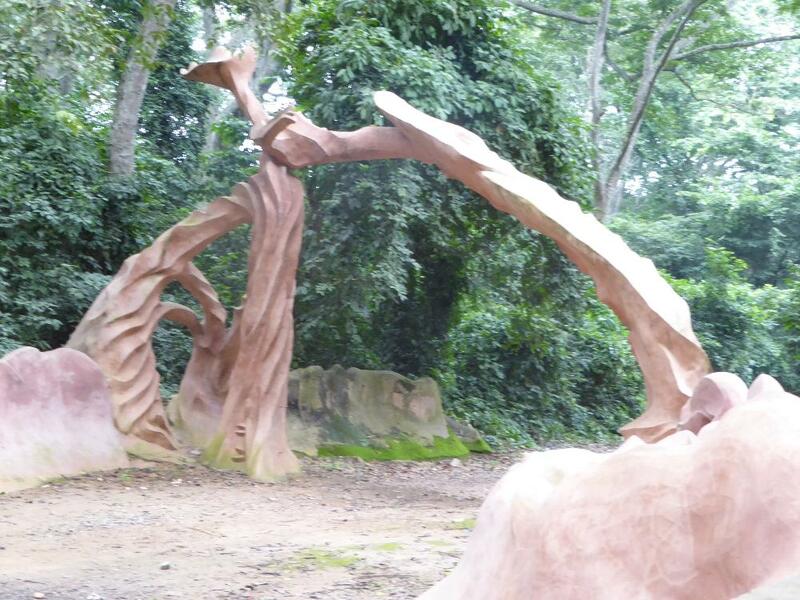 Conceived by Wenger, the original arch collapsed and was rebuilt by Wenger's chief collaborator, Adebisi Akanji, and his son, Nurudeen. As the son's name indicates, Adebisi was a Muslim. By profession, he was also a bricklayer, though one accustomed to the so-called Brazilian style introduced to Nigeria by returned slaves. This meant that besides laying brick he also designed and built ornamental animals in concrete. Beier writes that "it requires a person as sensitive as Adebisi Akanji to understand, interpret and execute Suzanne Wenger's unusual ideas," which may be true but which doesn't quite clarify who's done what. 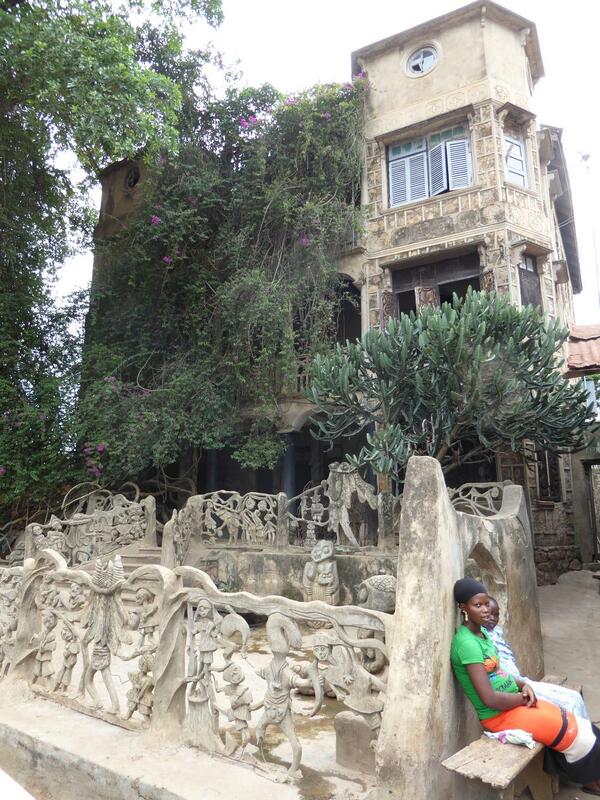 Wenger had gotten involved with the forest early in the 1960s, when she volunteered to repair this, the then-decaying First Palace, a shrine close to the river. Funds for the work came, ironically, not from the Yoruba community but from John Picton of the Nigerian Department of Antiquities. (Shades of the British restoring the Taj Mahal and the French saving Angkor!) A few months later Picton saw what Wenger had done and was horrified: “The building had been repaired but instead of the previously aniconic temple and grove we now have a riot of figurative sculpture and ornament.” Picton would later reconsider that judgment, but there is no doubt that Wenger was turning away from classical Yoruba art. Defending her work, she wrote, "We are modern and different, but we walk the ancient grounds." Somebody might argue that she was hijacking Yoruba tradition. 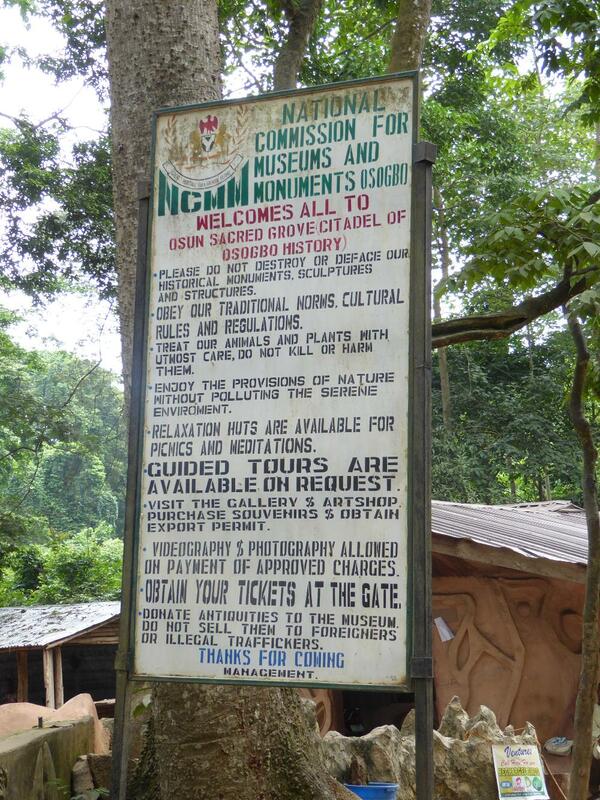 See Peter Probst, Osogbo and the Art of Heritage, 2011, p. 12 and p. 55. 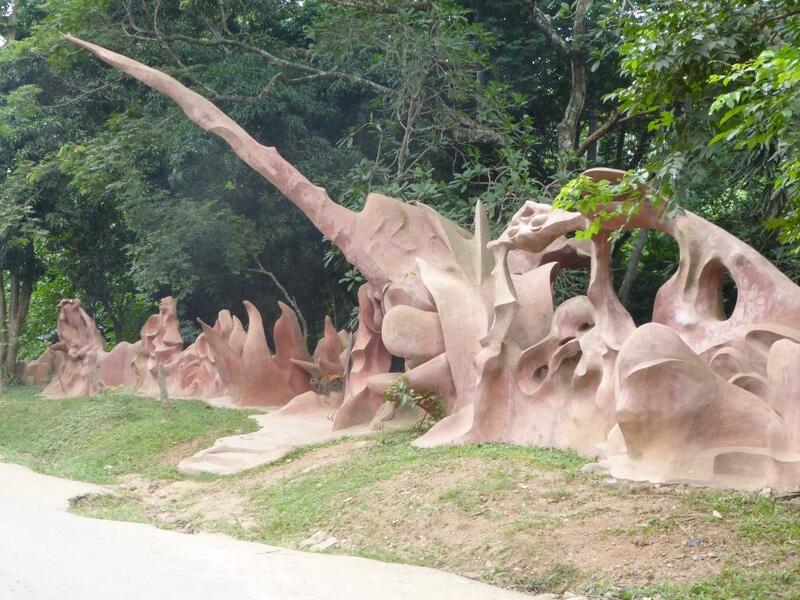 Close to the First Palace and on the bank of the river, this is Saka's representation of Osun. It's the third image on the spot and was added in 2008, a year before Wenger's death. Yes, that's a catfish emerging from Osun's feet. 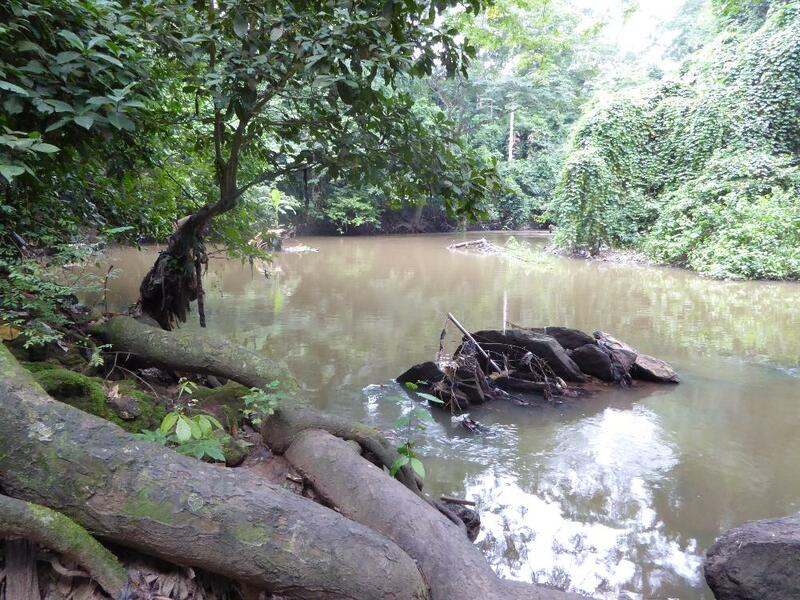 The explanation is that, as water, Osun is the mother of living things, fish included. Yikes! If the figure of Osun doesn't grab you, this will. Meet Obatala, another orisha. Yoruba religion makes room for 401 of them--which is to say an innumerable number. They are all fragments of Olodumare, the primeval deity. He had allowed his body to be divided into orishas representing different aspects of the cosmos. It's not so different from the religion of India, where innumerable gods turn out to be expressions of the One. Obatala, in any case, is the creator of human bodies. Wenger wrote that he was "the one who captured me.” He looks like he could do it, too, even if that's only because we've seen Alien and its ilk. Makes you wonder if Wenger did, too. Here's Iya-Mapo, the orisha who protects the business of women. She is the inventor of pottery, for example, which is why small shrines to her are found in many if not most Yoruba pottery workshops. Here, in a representation made by Wenger and Adebisi Akanji in 2008, the goddess faces heaven. One pair of arms is here to receive fertility, another to dispense it. The third pair is in the fist-over-fist gesture of the Ogboni, a Yoruba secret society. Naturally, I can't tell you anything about it. 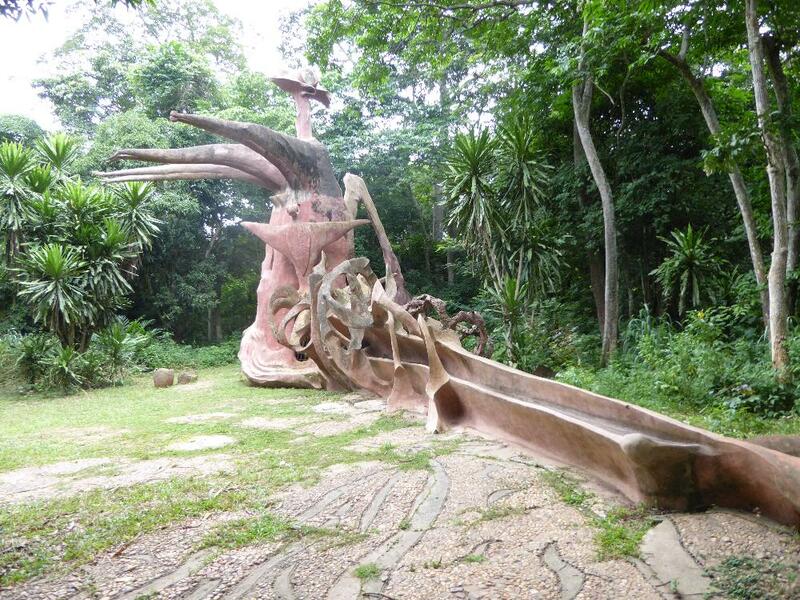 A tunnel-like gate, this is the entrance to the Igbo Ifa, a space devoted to diviners and herbalists (babalawos). Here's Ela. Beier has written that the Yoruba “want to be a link in the organism of the universe.” Prayer is a means to that end, and Ela is the orisha who facilitates that prayer. 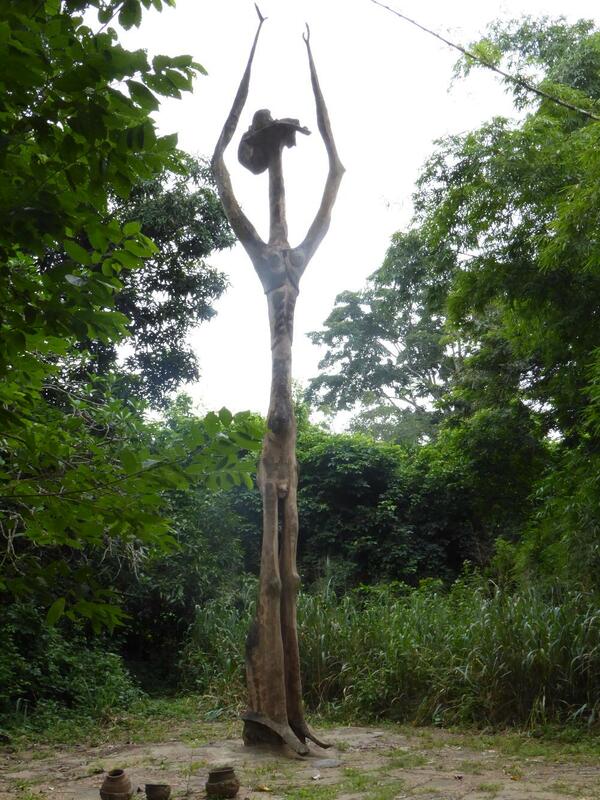 Reaching toward heaven, he stands on tiptoes in this representation completed by Wenger and Adebisi in 2000. The sacrificial vessels at his feet are for offerings made by worshippers. More mundane, perhaps, this is a mythological marketplace. 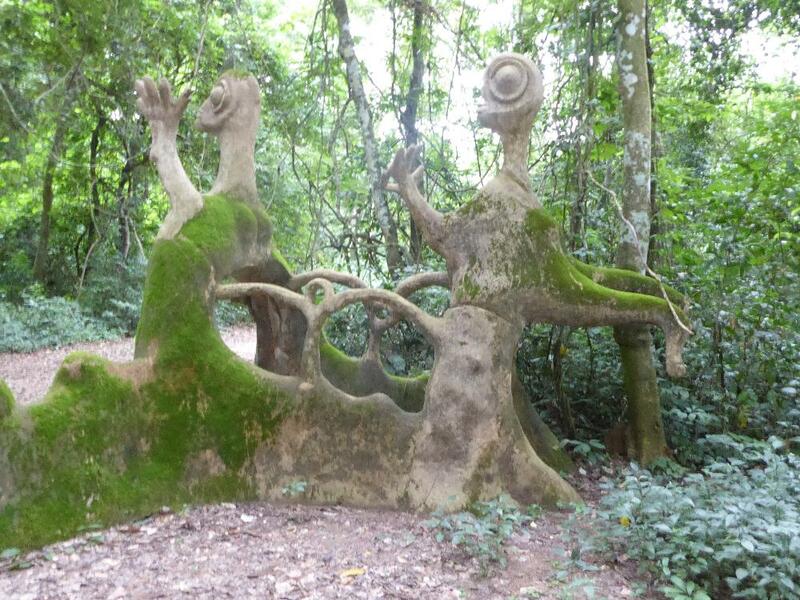 Someone might ask which came first: these sculptures or the Star Wars cantina. Unfortunately, the answer is Star Wars. Which brings us to the question of whether this place should be on the UNESCO World Heritage List. In 1966, Wenger and Beier had divorced; he left for New Guinea and she stayed behind. Difficult years lay ahead. Wenger had become a convert to Yoruba religion and indeed a priestess, but the Local Government Trade Council in 1985 wrote that she had "no place in our tradition and does not participate in any of the traditional rites.” From her perspective, this rejection might have been more tolerable than local plans for the forest. What plans? 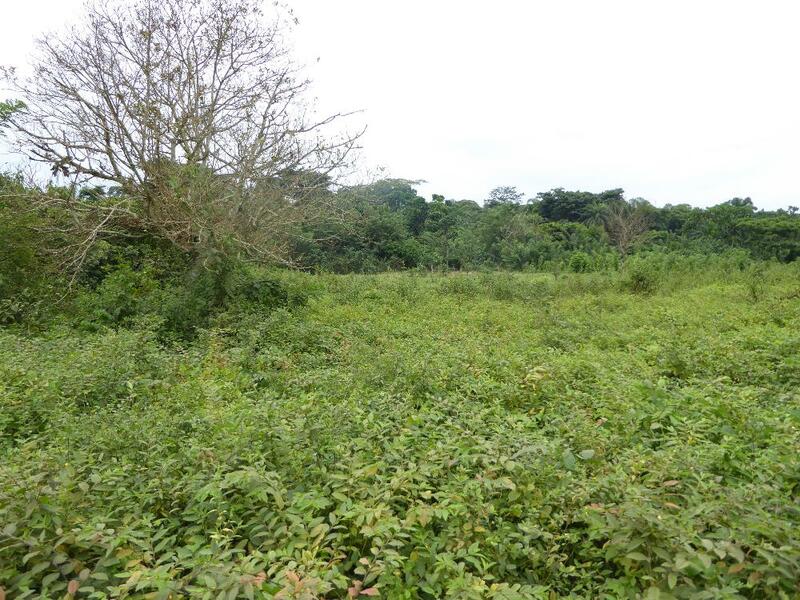 The Osun Heritage Council in 1986 hoped that the sacred grove would become another Mecca or Jerusalem. 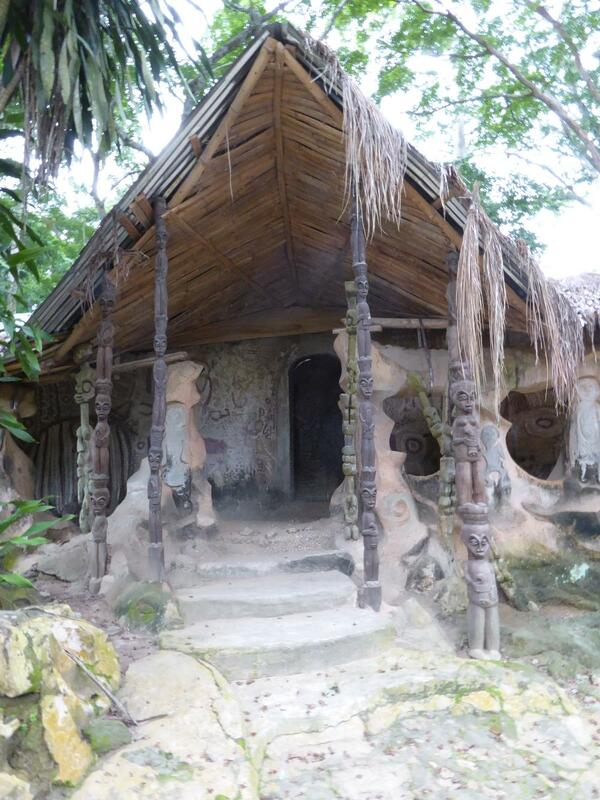 By 2003 the Oshogbo Progressive Union pointed out that Oshogbo "has the natural and precedent tendency of becoming a true African "Disney World." You can imagine Wenger's despair. The ataoja in 2001, who was Muslim, said that the annual festival was not about worship at all but about honoring tradition. Was that on the side of Disney? Hard to say. Then UNESCO came along, offering some protection to the site. Why? Was there someone at UNESCO who believed that this forest was indeed a sacred place, the last of its kind? Or was the decision a tourist-promotion hustle? If so, it hasn't been a very successful one: if five foreigners arrive, it's been a good day. Not that Oshogbo is to blame: when the immigration officer at Heathrow asks if you were in Nigeria on holiday, she smiles. 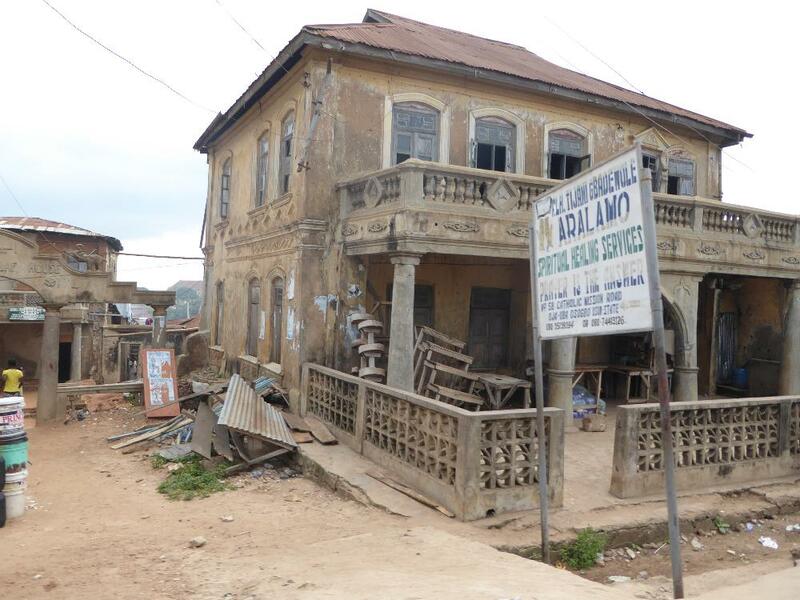 Adebisi Akanji helped transform this house that Wenger occupied in Oshogbo. She didn't build it: it had been built in the Brazilian style by the deputy to the ataoja, but Wenger and Adebisi had a lot of fun modifying it. Critics have been left shaking their heads. One, John Consentino, sniffs that Wenger had become "more Yoruba than the Oni of Ife," which is the equivalent of calling someone more Catholic than the pope. He goes on to ask if Wenger's work is "the iconoclastic revival of a fading religious tradition, or its exhumation and transformation into uplifting kitsch?" He leaves it open. See Donald John Consentino in Susan Vogel, Africa Explore, 1991, p. 248.